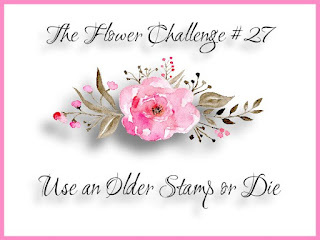 Hello everyone: Well, I'm here again with a little reminder post for THE FLOWER CHALLENGE in which we are asking you guys to use your older, older stamps or dies, you know? those neglected sets maybe at the bottom of a drawer or up in a box somewhere in your craft room. We want you to give them a chance to shine again. This is the card I made to inspire you to come and play along with my teammates and I in our gallery. This is my oldest flower stamp set, it's from SU, it's called Eastern Influences and it's from 2008!! The flower and the swallows are stamped on a piece of white card stock with Stazon black ink, I colored the flower with my Prismacolor pencils and paper stumps dipped in Gamsol, then, I fussy cut all of this images. I stamped the branch on a die cut piece of black card stock with Versamark ink and heat embossed it with white embossing powder then glued my images on top. The Joy sentiment is from a Penny Black die set "Love and Joy". I also found a little bag with this very shiny fabric so I thought of putting a piece in the back just for a bit of bling. I love this sentiment from Power Poppy's "Short Stacks", the punched detail at the top is from an ultra old Friskars punch, the cherry branch from the SU set. So I hope you come along and play with us at THE FLOWER CHALLENGE gallery, just remember to read our rules and please add our banner to your blog post when you upload your card. Hello everyone: Before I continue, I want to wish all of you who come to my blog and leave me your sweet, wonderful comments. It's an honor and a Joy to read them and to know you like the cards I make, I feel truly grateful for each word you say. This is the last challenge for the year 2018 for SHOPPING OUR STASH, my teammates and I will be taking a Holiday break and will be back on January 8th. 2019 with the first challenge of the year, hope to see you then. This challenge is a Christmas one and just in time for you to make a few more Christmas cards, I know from experience that, when you think you have all the cards you need for family and friends, there is always a couple more that need to be made so, here is my card that I hope will inspire you to come and play along with us in our gallery. This stamp and die set are from Stampin' Up! and they have been in my stash since I bought them back in August or September of 2017 when they came out in the Holiday Catalog. I just love the gorgeous silhouette images on the stamps and dies. 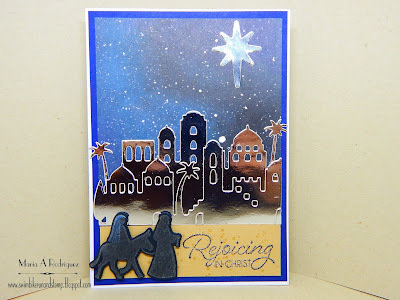 I stamped the image of Mary, Joseph and the Donkey on black card stock with gray ink and added a bit of color to Her veil. The buildings are die cut out of silver foil card stock and the sentiment is stamped once in black ink and a second time with silver glitter embossing powder. The night sky is pattern paper I found at the bottom of my DSP drawer, lucky me!!! This is the way the INSIDE of my card looks like. I had to cut the buildings a bit to fit the front panel but I didn't want to throw that piece away, it's just so pretty so I glued it to the corner, the sentiment is from another beautiful SU set called "All Ye Faithful". I hope you go and stop by the SHOPPING OUR STASH blog to get more inspiration from my teammates and they come and play along with us.